Just Last Season is the home of Jacques Vert Groups last season clothing. Our pieces from classic brands Jacques Vert, Windsmoor, PrecisPetite, Minuet Petite, Kaliko, Planet, Eastex and Dash are available with up to 70% off. Whether it is a jacket, dress or head-to-toe wedding outfit, the selection on offer is simply unrivalled. Indulge in beautiful dresses, luxury coats, relaxed separates and coordinating accessories update your wardrobe today with Just Last Season. Last seasons treasures are sure to be next seasons gems. This classic tailored jacket features a single corded button design, a flattering raised collar neckline and luxury satin trims. The teal shade is elegant and offers a simple statement. This new coat style features luxurious textured faux fur with a statement shawl collar and detachable embellished brooch. This coat is sophisticated and glamorous - the perfect style for an evening occasion. A Dash core essential, this relaxed jersey top features 3/4 length sleeves and a scoop neckline. The neutral cream shade will make everyday dressing a piece of cake! Protect yourself from the winter weather with this mid length quilted coat in indigo. Boasting heavy duty padding, zip pockets and flattering dart detail for extra shape, this coat will help you forget the cold in no time! Protect yourself from the winter weather with this mid length quilted coat in claret. Boasting heavy duty padding, zip pockets and flattering dart detail for extra shape, this coat will help you forget the cold in no time! This gorgeously feminine corded lace shift dress is presented in tonal shades grey with satin lining. Featuring premium scalloped edging along the neckline, hem and short sleeves, this will be your go-to occasion dress of the season. With an abstract leaf embroidery, this quilted gilet boasts a classic shade of navy throughout, has functional pockets and features flattering band detail at the back. With a plain collar, this coat has pressed stud fastening in antique gold. In a classic shade of navy, this peached effect quilted raincoat boasts a stylish leaf embroidery design and a pressed stud fastening in antique gold. With turn-back cuffs and functioning side pockets, this piece will be a winter wardrobe essential. This versatile jumper features a midnight blue supersoft knit fabric with beautiful bead and stone embellishment all over. With 3/4 sleeves and a scoop neckline for a stylish look. In a luxurious black shantung, this dress features a beautiful exclusive orchid print and contrast satin piping at the neckline. With shaped seams to flatter the figure. Boasting an all-over sequin design, this gorgeous shift style dress just oozes elegance. In a contemporary shade of black and featuring short sleeves, this occasionwear must-have will have you turning heads all season long. This cosy coat is double-breasted, with storm cuffs, an elasticated detachable belt and an asymmetric zip. It features horizontal padding detail, front pockets and a metallic popper fastening. Part of the Lorcan Mullany for Jacques Vert collection. This dramatic gown features statement bead embellishment with a hand-stitched ruched design across the body. With a chiffon capelet to cover the shoulders for elegant, demure style. Make a statement with this season's must-have floral draped jersey dress. 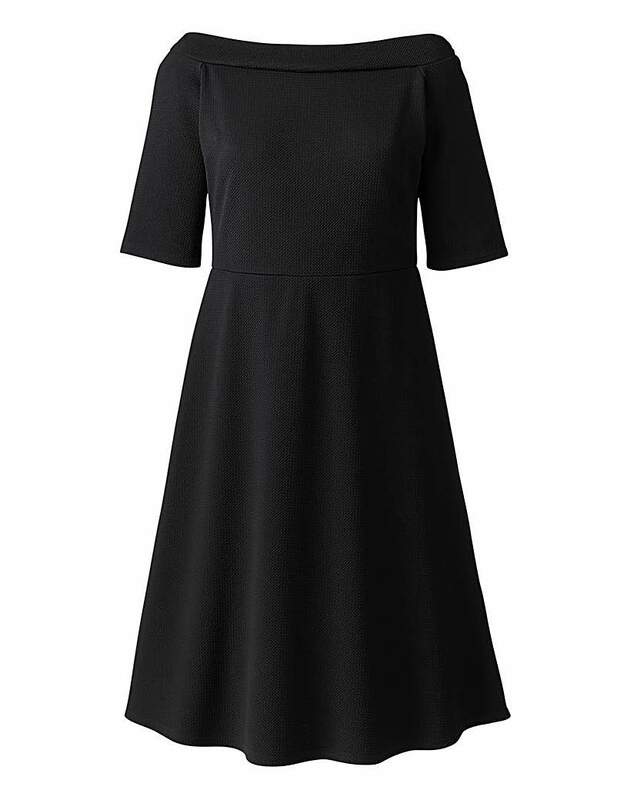 Boasting a graphic floral design and cap sleeves this dress also features asymmetric pleats at the waist for an extra flattering fit. Steal the spotlight with this stylish velvet top. Boasting an on-trend animal print and with 3/4 length sleeves, this must-have top also features a sheer base fabric for added interest and has a cowl neckline for a contemporary look. With bursts of teal, mint and jade, this animal print jersey jacket will be a wardrobe must-have this season. Boasting a contemporary edge-to-edge design and long sleeves for extra warmth, this lovely cover-up will definitely be a head turner. This super-soft knit jumper will be a wardrobe staple season-upon-season. Boasting a contemporary animal print design and 3/4 length sleeves, this must-have jumper would look great teamed with a smart trouser or skirt for an alternative workwear look. This super-soft knit skirt will be a wardrobe staple season-upon-season. Boasting a contemporary animal print design and stylish pencil shape, this skirt would look great teamed with the matching jumper for an alternative workwear look. Boasting a obling shape and chiffon base, this scarf features an all-over animal print and will be the perfect accompaniment to any outfit this season. In a classic animal design, this coat boasts a padded feel and has a detachable fur collar that can be removed for different and versatile looks. With popper fasteners, this easy-to-wear coat will be a practical yet stylish addition to your wardrobe. In an all-over animal print design, this scarf boasts an oblong shape and will be the perfect accompaniment to any outfit this season.